Back in late March, we were excited to get a call from Baz Halpin, with Silent House Productions. He had designed an amazing set for the Black Sabbath tour (an historic tour as it was the first tour with Ozzy Osbourne in more than thirty years), and he wanted our help in translating his innovative design into reality. After receiving Baz’s initial designs, Shane Nelsen, Sew What? Creative Director and Senior Sales, met with Baz and his team at the Silent House office to further review Baz’s design and vision for the backdrop. This meeting gave Shane the opportunity to hear more about the look Baz was going for and suggest materials and sewing methods that would take the design to reality. During this collaboration, a design was approved utilizing FR Black 16oz Commando Cloth, FR Black Sharkstooth Scrim, and Silver Metal Mesh. 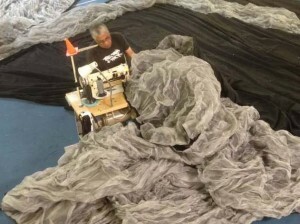 At that point, our sewing shop went into action, first manufacturing a custom flat black backdrop in Commando Cloth at 41′ 6″ h x 60′ w (split into three sections attached by velcro). From that initial simple drape, our team of sewing staff began the transformation from basic to extraordinary by first judiciously cutting out sections, then inserting Sharkstooth Scrim behind the cutouts, crinkling and “distressing” the aluminum mesh, and then finally appliqueing the aluminum mesh in strategically placed locations. Sew What? 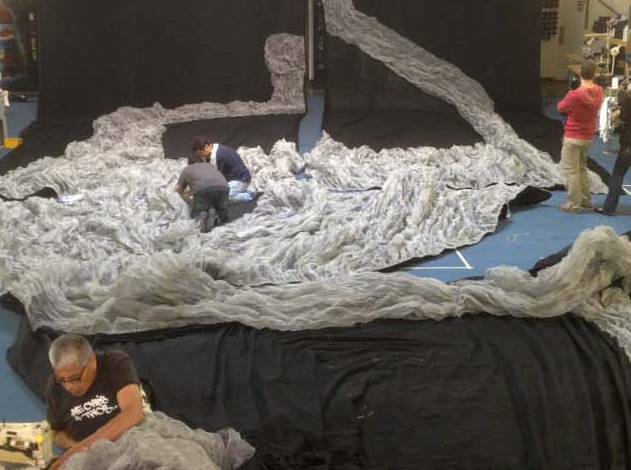 manufacturing staff Roberto and Antonio, pinning mounds of aluminum mesh onto the backdrop. On several occasions throughout the manufacturing process, members of Baz’s team came out to our shop to review the work and collobarate with Shane to tweak the design to achieve the desired ultimate “heavy metal” look. The final backdrop looked amazing in our shop, but the final touch was added by Silent House who, after receiving the backdrop from us, hung LED walls behind the scrim sections, allowing video images of the concert to be seen within the backdrop itself. We were awestruck this morning to see a video of it live on stage in Auckland, New Zealand. Take a look, and I think you will be awestruck as well! Featured in this installment of “Meet the Staff” is a woman who has been here practically from the beginning—Silvia Soler. She is arguably the backbone of both companies, and her incredible ability to handle any task that is put before her has helped ensure its continued and ever-growing success. Please read on to learn a little bit more about this very special person, and why we are so thrilled to have her be such an important resource for both companies. When did you first start at Sew What?/Rent What? Silvia started back in May of 2003. She was just about to turn 21, and has often said that she has the honor of calling herself the first official SW office employee. Already an incredible multi-tasker, she has done a little bit of everything for the company—from answering phones, to sales, accounting, human resources, translation, company event planning and much more. She also is an occasional contributor to this blog! She said that she’s pretty much ok with anywhere she can lay on a beach and sip a fruity cocktail. (Sounds nice!) But if she had to choose one destination right now, she would say that she’s currently obsessed with visiting Cuba. Her husband is Cuban/American, and they’ve always dreamed of exploring the pristine beaches of Cuba, and exploring the country and all of its history, too. What kind of work did you do before coming to Sew What?/Rent What? She was the receptionist for a legal advertising company. She learned a lot there, but is so happy that she found Sew What! She’s been with SW? for 10 years, and has basically been able to actually grow up with the company, and has been excited to see it shine and succeed into the amazing company it has become today. Silvia is an incredible freelance makeup artist in her free time, and has a blast doing it! She took a few classes to learn the basics, but mostly it’s a creative-driven industry, so it’s all about practice, practice, practice! Some of her work is more prominently displayed on “rock goddess” Megan Dawn of Without Warning. What is your favorite memory from being part of the Sew What? / Rent What? family? Silvia is an LA girl born and raised so her teams are the Dodgers and the Lakers. Current TV shows she loves are The Walking Dead and Mad Men (she won’t share her favorite books because she thinks they are “totally embarrassing”). 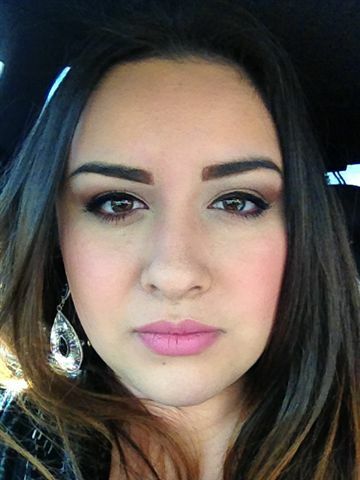 She really loves researching new makeup lines, dancing, doing Zumba, and shopping– of course! She admits that in those ways she is “just a typical girl”. Well, we cannot wait to see what fantastic rental drapes you and Megan come up with, Silvia, and we appreciate ALL that you do for this company on a day to day basis! 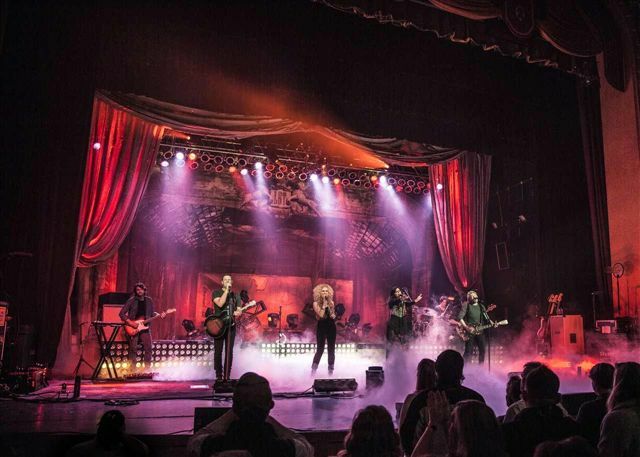 As our regular readers know from earlier posts, we have been honored for the last several years to be selected to provide custom digital backdrops and stage drapes for the tours of award-winning country vocal group, Little Big Town. When we were contacted again earlier this year in advance of the group’s Tornado Tour (after their current album), we were of course excited, but when we saw the amazing stage design, we were blown away and couldn’t wait to start. The phenomonal design by Raj Kapoor of Raj Kapoor Productions is truly unique. Upstage appears to be a very ornate, traditional theatre with a glass ceiling being “blown away” by a tornado. In reality, this is a single 24′ h x 40′ w backdrop digitally printed onto Heavy Knit, with incredible perspective within the artwork, adding the trompe l’oeil effect. The addition of Pewter Textura legs and swags downstage adds to the drama and makes the upstage scene appear even more realistic. It truly is a draw-dropping design, and one we particularly enjoyed working on. If you want to see more, check out our Portfolio page. Or see it in person – Little Big Town is scheduled to tour through the end of the year. 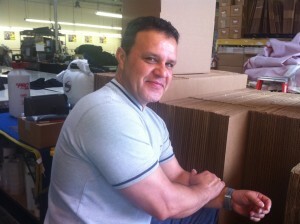 In our next installment of “Meet the Staff”, I would like to introduce you to Raul Avila. He is the Shipping and Receiving Manager for Sew What?, and is by far one of the hardest working individuals in both companies combined. His amazing work ethic, his intelligent decision-making skills regarding the extremely complex logistics here at Sew What? on a daily basis, and of course his infectious upbeat personality, all make him one of our “MVP”s for sure! Please take a moment and read more about why we are so happy to have Raul as an important part of the “Whatters” team. When did you first start at Sew What?/Rent What? What were you originally hired to do, and how have your duties changed since working here? I was hired in March of 2003 as a driver for Sew What? From 2005 through 2010 I was the Warehouse Manager, managing the sewing staff and having my hands in practically everything that involved the warehouse. Then in 2010 I became the Shipping and Receiving Manager for Sew What?, where I am currently still today. This encompasses all inbound and outbound shipping for Sew What?, packaging, ordering stock item supplies, obtaining shipping quotes for SW? sales reps, and basically handling everything from purchases coming into the warehouse to all orders going out the door. I would love to go to Jerusalem or Italy. The religious culture of both countries is fascinating to me, and it would be a dream come true to be able to experience it first-hand. I was a warehouse supervisor working for UPS. I primarily moved ocean freight—loading and unloading containers and trailers for transport on the mainland. It was hard work, but it gave me an incredible education regarding freight, shipping, packing, and everything else I do now to help make my work here at SW? more efficient. Several years ago Sew What? had a retreat at a local hotel in Newport Beach which was such a memorable and special experience. We got to learn about what all the departments do, and getting to hang out with my colleagues outside of the office in a more “personal” environment was really great, too. I watch the news every day to help keep informed on my world and community around me. I also like to watch the Barcelona Soccer Team, which keeps my blood pressure pumping! I love the movie Braveheart, and my favorite book is El Hombre Mas Grande Del Mundo. I like to read a newspaper every morning—it’s the only time of the day that is just for me. I also like to stay in shape as much as possible so that I’m strong for my job. I love doing strength training and cardio workouts at home while listening to classical music like Francesco Cespedez and Andrea Bocelli. I also love to play basketball and soccer with my 17 year old son. He really keeps me on my toes, that’s for sure! Every single day is a challenge for me—getting the shipments arranged, packaged, and out the door with the right carrier at the right speed going to the right location is all mentally stimulating for me, and keeps my mind fresh. I feel greatly satisfied at the end of every single day, knowing that my job has been completed correctly and that our clients are happy! Churches aren’t necessarily the dusty, stuffy, dark and boring places they may have seemed in the past. Nowadays, modern churches are huge communities of individuals who offer their members day care services, gyms, and coffee shops, and their weekly services often take place in huge amphitheaters that can fit hundreds, and sometimes thousands, of people at one time. They enjoy everything from rock concerts and huge theatrical productions to one-on-one mentorship. Easter is an especially wonderful season for us here at Rent What? Inc., because we get to help create fantastic and memorable Easter Sunday programs for these modern church communities to enjoy and talk about long after the service is over. We do this by providing a variety of rental stage drapes, solenoid systems, traveller track and anything else these amazing churches from all over the country may need to help make their service a complete success. Just this past month we got to work with Jon Ackerman and their team of creative production designers at The MET Collective, a multi-branch church located in Houston, Texas, to help give their Easter Sunday service a little extra “wow” factor. Utilizing our lightweight, easy-to-install, and highly dependable 10-head V2 Solenoid System, they were able to drop some of their own personal drapery during a dramatic and exciting part of their band’s performance, much to the delight of the hundreds of people watching the service live and online. Jon was nice enough to send us a video of the service, including the actual dropping of their Kabuki drapes from the rented solenoids, and we are excited to share the video with our readers (keep an eye on the left and right sides of the screen to see the drapes drop into view). We were thrilled to be a part of such an exciting event, and look forward to working with incredible churches like The MET again for any special production they may come up with.